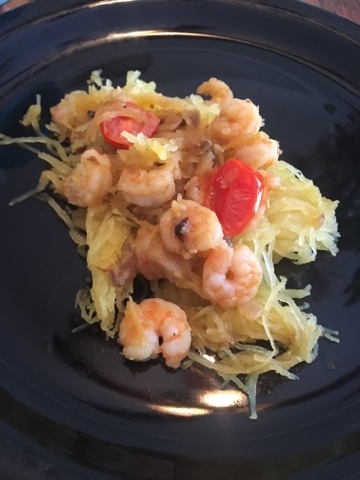 If you would have told me 5 years ago that spaghetti squash was going to be one of my new favorite meals, I would have thought you were nuts. It has taken Brian a little getting use to but he enjoys it as well. When I made this for dinner last week, Ella even asked for seconds. (Austin is another story) I'm so excited to find a healthy meal that everyone loves. I recommend having a really sharp knife and some muscle to be able to cut through the skin of the squash. It can be a little tough. You don't need a huge butchers knife. Using a small paring knife works just as well. One tip I have learned over the times of trying to cut into some of the toughest skin, is to throw it in the microwave for two minutes. It helps to softer the skin just enough to make cutting easier. 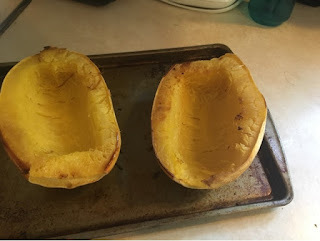 You can also freeze the shredded squash for quick simple meals later. There are so many options you can do with the Spaghetti squash once it is cooked. Some of our family favorites are using as pasta and adding red sauce, making little hash patties for breakast, and added a protein and a bunch of veggies. The dinner below was shrimp with mushrooms, grape tomatos, garlic, onion, and fresh lemon juice. 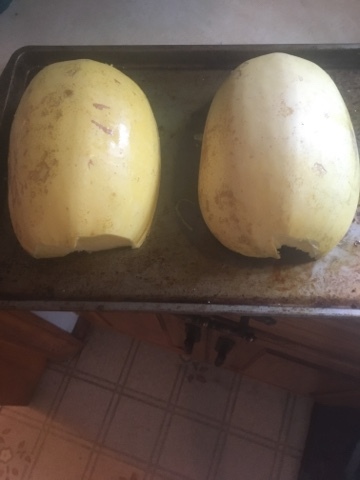 2- Cut spaghetti squash in half, length wise. 3- Use a spoon to scoop out seeds. 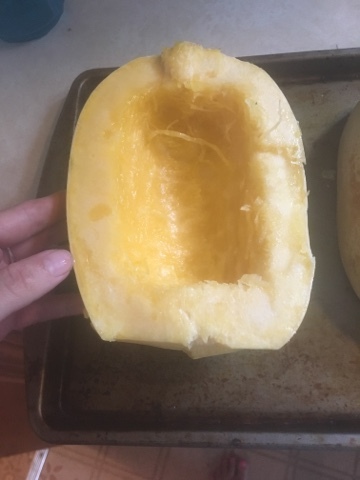 4- Brush or spray oil on the cut side of the squash. Then sprinkle with salt. 5- Place on baking sheet, cut side down. Bake for 45-60 minutes depending on size of your squash. 6- Remove from oven and let cool for 5-10 minutes. 7- Use a fork to break up strands. 8- Serve alone or with your favorite meal.